Fill a Cup, Feed a Veteran, Help a Pup! 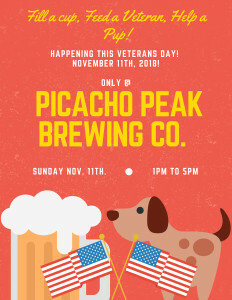 Happening this Veterans Day! This Veterans Day help honor our Veterans and support the Animal Services Center of the Mesilla Vally. Bring food for a Veteran! Canned goods, bottled water, boxed food items (ie. maccaroni & cheese) etc. Also bring Goodies for a Pup! Dog food, dog treats, leashes, towels, and chew toys. You can also find a new furry friend! 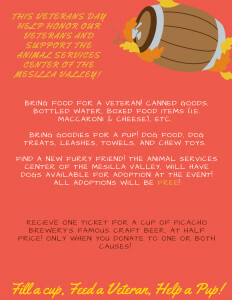 ASCMV will have dogs available for adoption at the event! All adoptions will be FREE! Donate to one or both cause and receive one ticket for a cup of Picacho Brewery’s famous craft beer at half price.